perfect choice for adventurous and looking for new experiences couples. Le Grotte della Civita hotel is located in the heart of the old town of Sassi di Matera, a place of great historic and architectural value, recognized and protected by the UNESCO as a World Heritage. La Civita is the oldest part of the Sassi, considered as the hidden heart of ancient pastoral communities, which now houses, in its caves, a particularly popular and charming compound hotel with its rooms spread across different buildings. Le Grotte della Civita is a compound hotel that was built thanks to a unique project that has preserved the original spaces, with respect, through extreme choices. The 18 rooms were obtained from cliff caves and the common area was once a rupestrian church. The hotel is characterized by the unique shape of its spaces and for the minimalist furniture embedded into the rock that doesn’t create an excessive contrast, but enhances the large size of individual rooms. The irregularities of the surfaces welcome the few pieces of furniture made with simple shapes and secular material recovery. 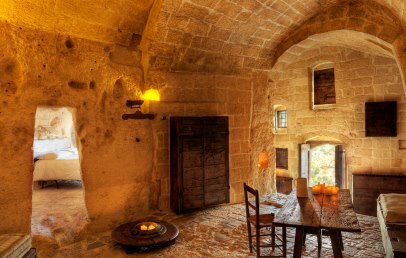 The hotel Le Grotte della Civita is an intriguing dwelling of unique charm, that offers its guests an unforgettable experience. Le Grotte della Civita is composed of 18 rooms spread over eighteen different caves. The rooms are large and characterized by special light effects. The decor is basic and simple, made with recycled materials.You may choose between the Classic and the Superior rooms, the Suite and the Executive Suite which differ in the square footage and include a fresh fruit basket in room upon arrival, fresh water every day and a delicious breakfast with local products served in a thirteenth century rupestrian church. 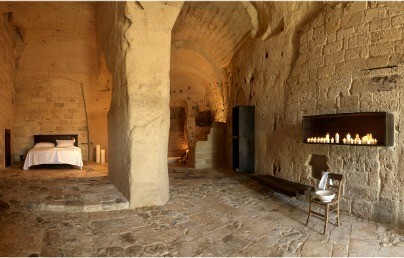 Guests of Le Grotte della Civita can have breakfast in the rupestrian church of the thirteenth century beside the hotel. In the evening, the church becomes an even more soft and beautiful place and, on request, you can participate in wine tastings and dinners with local products with classical music playng in the background. 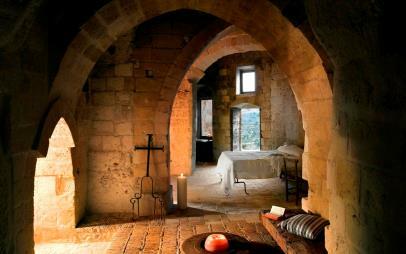 At disposal of the guests there is the Cripta della Civita, a common space converted from a rupestrian church. Le Grotte della Civita organize exclusive guided tours (Sextantio), bike tours and trekking paths in order for you to get to know the beautiful city of Matera. For wine and food lovers it will be possible to request exclusive dinners and tastings. Double rooms with double bed. Obtained from different caves of which the compound hotel is composed. Characterized by special light effects and by basic and simple pieces of furniture made with recycled materials. The bathrooms are equipped with a shower made on stone. At the arrival, guests will find fresh fruit, water and lighted candles offering a romantic atmosphere. Double rooms with double bed. Obtained from different caves of which the compound hotel is composed. Characterized by special light effects and by basic and simple pieces of furniture, made with recycled materials. 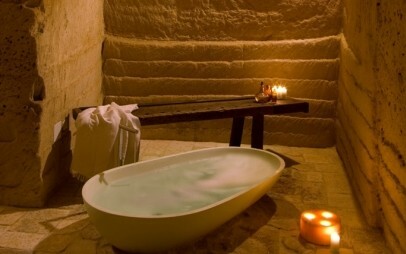 The bathrooms have stone walls and are equipped with bathtub. At the arrival, guests will find fresh fruit, water and lighted candles offering a romantic atmosphere. Double rooms with double bed. Obtained from different caves of which the compound hotel is composed. Characterized by special light effects and by basic and simple pieces of furniture, made with recycled materials. 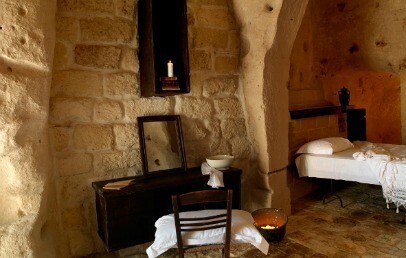 The bathrooms have stone walls and are equipped with shower and bath. At the arrival, guests will find fresh fruit, water and lighted candles offering a romantic atmosphere. Obtained from different caves of which the compound hotel is composed, the two Executive Suite Cave are characterized by special light effects and by basic and simple pieces of furniture, made with recycled materials. 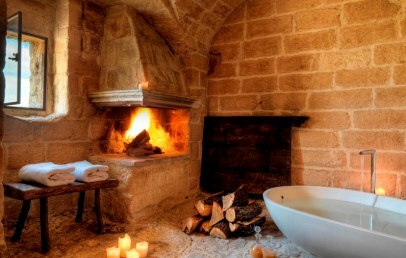 One of the room (about 140 sqm) features a fireplace, a bathroom with stone walls and equipped with bath and a panoramic balcony. 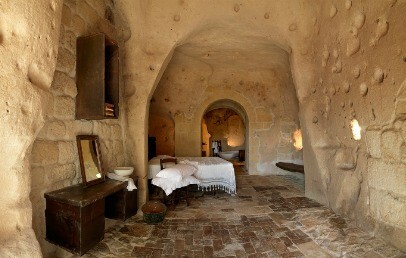 The second Executive Suite Cave (about 160 smq) has a bathroom with stone walls and equipped with bath and shower.